When I was at the launch of the new Dior Addict lipsticks, I remembered being rather captivated by a coral lipstick but heavens! The name had totally escaped me! So I went to a Dior counter recently and the sales assistant tried to jog my memory “Bobo? Tango?” Err… What? Ended up swatching all the coral lippes in the range and I ended up with #652 Tango. The new Dior Addict lipsticks are like a cross between the Addict and Addict High Shine lipsticks. They are fairly pigmented (different ranges within the line are more pigmented than others) but in the main apply a little sheer with a shine to it. Here is a swatch of Tango on the back of my hand, swatched just once. The packaging too has been changed, from the translucent dark blue cap to a pearly white. Don’t bother trying to twist the metallic strip bit. What you should do is pull the round knob at the end of the lipstick and it’ll slide out like butter. I’ll be honest. Haute Couture or not, I’m not quite feeling the packaging. For some reason it strikes me as being a little plain and a bit “top heavy”. I think I prefer my lipstick tubes to look a little more “substantial” so I prefer opaque packaging. 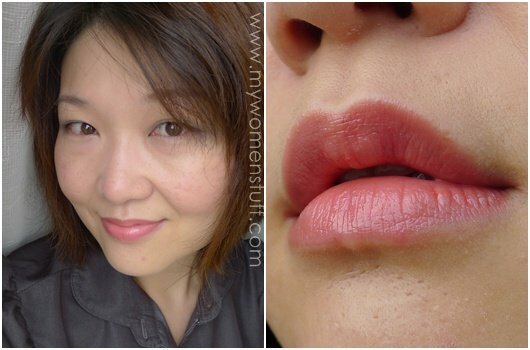 Still, it suits the texture of this lipstick which is like pigmented lipbalm. The lipstick slicks on like lipbalm and does not dry my lips out at all. I love the texture. Its got a nice slip and because its a little sheer, you can apply it in the car (not while driving of course) and be alright even if its not quite perfect, because the sheerness and shine will help hide the little imperfections. As you can see in the photo, the colour on the lips has a pink tone which flatters me better than if it was just straight orange or coral. The colours look a little different but that’s really how it is on the lips. It looks a little different depending on how the light hits it, and you can see that it imparts a nice shine. The little fly in the ointment would be the wear time. Because its got slip and is rather sheer and applies like a balm, do not expect a long wear time. I had it last about 4 hours during which I had drinks, and talked a lot. I also tend to wipe off all my lipstick after lunch. I don’t count this against this lipstick because wear time is never really an issue for me. If my lipsticks wear off, I reapply. Dior Addict lipsticks retail at RM90 each at all Dior counters and come in 44 colours. very moisture and i love it …. 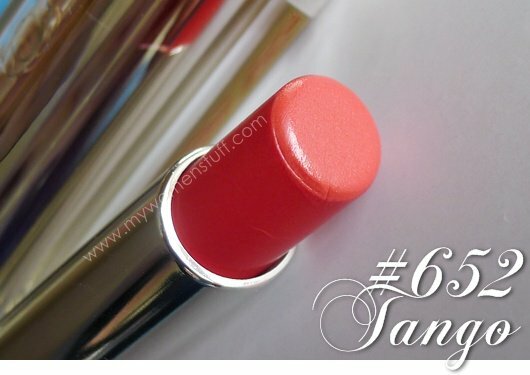 I could not find it first as well, but it is tango 652 here in is one of the colours of the new summer line! totally beautiful colour i tried bobo as well but found this to be more special. I could not figure out which one to get yet, but now I’m leaning towards coral shades too. 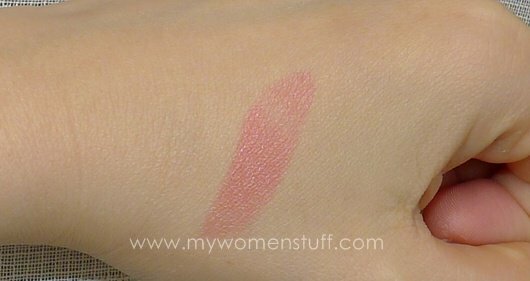 strange but it doesnt look like it has any bit of coral in your fotd. The pink suits u really well. But the lipstick photo looks coral. I need to check them out in person. From the photos look of it, i prefer the serum lipsticks. Looks more chic in terms of packaging. I wish the serum lippies has more color choices though. I’m now also looking very forward to the new launch of the chanel’s rouge coco shine. 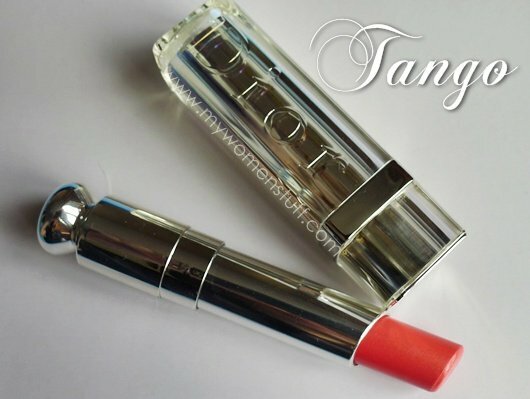 Oh Tango is such a gorgeous colour! Looks lovely on you, PB! Anyway, it’s already on my lips since today thanks to Parkson Alamanda. Where can I purchase Tango 652 ? Depending on where you are, it might be best to check with your local Dior counter and see when they’ll get it back in stock. Thanks.